On Saturday, February 11, 2012 free hockey card packs will be given away through Upper Deck’s network of Certified Diamond Dealers who operate brick and mortar hobby shops throughout Canada. Most of these retailers will be running a variety of other events and specials to make the most of this special day. This program is exclusive to Canada and only Canadian-born players are featured in the set so there is a true sense of national pride in putting it together. Additionally, three subsets (five cards each) showcase the top rookies, stars and legends of the NHL. Next, a special 16th card is available to fans as a gift with purchase of Sidney Crosby featuring him as a member of Team Canada. Upper Deck will also be sprinkling in some very limited autograph cards randomly into packs as well of some big names that will be sure to have collectors excited. 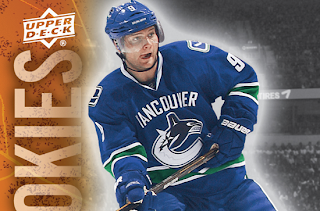 Collectors who visit a London Drugs or Toys “R” Us and make an Upper Deck purchase can receive a special National Hockey Card Day blow-up card. The five players featured will be Ryan Nugent-Hopkins, Roberto Luongo, Jonathan Toews, Mario Lemieux and Wayne Gretzky. Upper Deck will also be taking the experience of National Hockey Card Day online with fans through the special Facebook page created for the program. Upper Deck will offer fans a variety of FREE giveaways where they can score packs, boxes, blow-up cards and signed memorabilia just for sharing their experience with us by posting photographs or video to that Facebook page. Make sure you “Like” that page today to take part and get other updates about the event!